Natural gas transmission pipelines received 551.6 million gigajoules of natural gas from fields, gathering systems and plants in November, down 3.1% from the same month in 2017. In November, natural gas transmission and distribution systems delivered 227.9 million gigajoules to industrial consumers, 68.0 million gigajoules to residential consumers and 59.9 million gigajoules to commercial and institutional consumers. Canadian natural gas distribution systems reported $703.9 million in revenues from residential consumers and $331.5 million from commercial and institutional consumers in November. Alberta deliveries of natural gas amounted to 180.1 million gigajoules in November. The vast majority (83.0%) were to the industrial sector, which accounted for 42.0% of all natural gas delivered in Canada. Meanwhile, natural gas transmission and distribution systems delivered 89.6 million gigajoules of natural gas in Ontario. 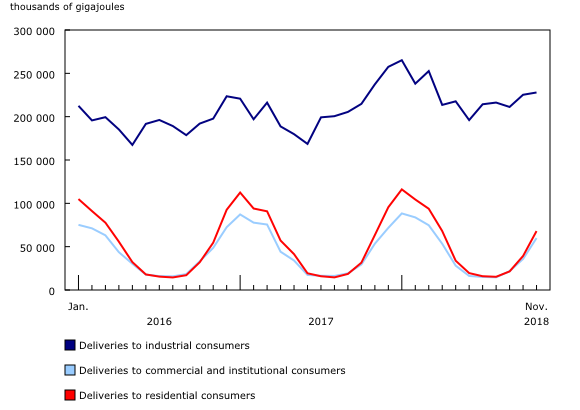 Of this total, 33.2 million gigajoules were delivered to the residential sector, which accounted for 48.8% of deliveries to residential consumers in Canada. In November, opening inventories of natural gas held in Canadian facilities totalled 962.3 million gigajoules. During the month, inventories decreased 2.0% to 943.5 million gigajoules. This was the first decline in inventories in six months as demand for natural gas increases in the winter months. Additionally, this was the lowest recorded November inventory level since this data series started in January 2016. 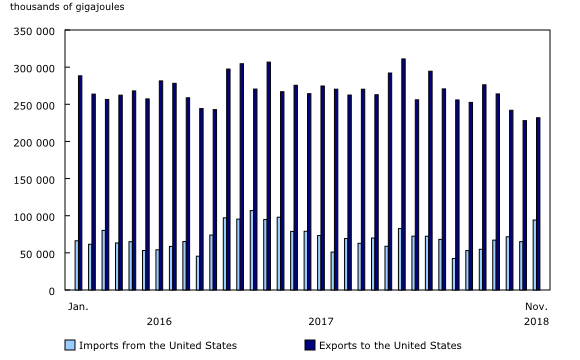 Canadian exports of natural gas by pipeline to the United States totalled 231.9 million gigajoules in November. Exports from British Columbia remained low for the month as crews continued to repair the damage caused by a pipeline explosion on October 9, near Prince George, British Columbia. Meanwhile, imports to Canada from the United States totalled 94.2 million gigajoules. As of reference month January 2016, the term marketable natural gas was replaced by the current term, natural gas from fields, gas-gathering systems and gas plants. Natural gas deliveries (termed "sales" in releases prior to January 2016) include deliveries to industrial, commercial and institutional, and residential consumers. 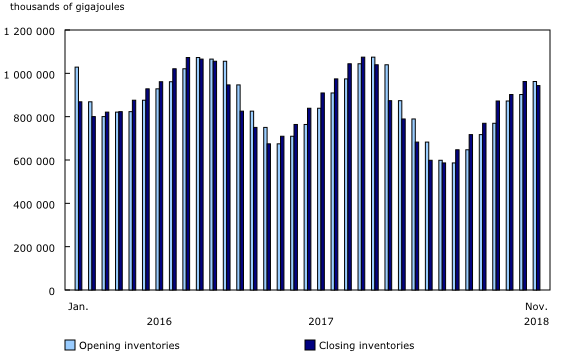 Opening inventories correspond to inventories as of the first day of the reference month, while closing inventories correspond to inventories as of the last day of the reference month. For example, the reference period for the opening inventory in January was January 1, while the reference period for the closing inventory was January 31. Pipeline fuel is used to power compressors to move gas through pipelines.